For decades it’s been hidden behind billboards or wrapped in a giant faux shopping bag. Many shoppers never even notice it. But old photos reveal a five-story building (right, in 1906), sticking out like a sore thumb in front of the world’s most iconic department store. 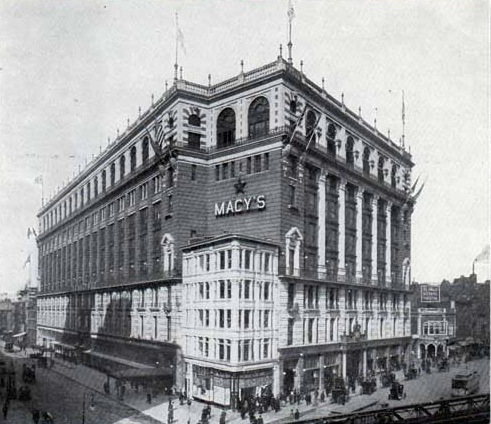 Although Macy’s leases ad space on it, the five-story building has never been owned by the store and is one of the most famous “holdouts” in New York real estate history. It all started around 1900, when Macy’s, then located on West 14th Street, began picking up land in Herald Square for its huge new shopping mecca. Macy’s had a verbal agreement to buy a plot at the corner of 34th and Broadway. But an agent acting on behalf of rival department store Siegel-Cooper scored the plot instead. Reportedly the agent wanted Macy’s to give Siegel-Cooper its 14th Street store in exchange for the land at 34th Street. But Macy’s wouldn’t have it. The store was built around the plot. In 1903, Siegel-Cooper put up the five-story building there today. This entry was posted on March 3, 2011 at 5:40 am and is filed under Defunct department stores, Fashion and shopping, Midtown, West Village. You can follow any responses to this entry through the RSS 2.0 feed. You can leave a response, or trackback from your own site. I can’t believe that the building is so old, it just look like as if it has been constructed recently. I would like to visit this Macy’s building. This is amazing. I have been shopping in Macy’s my whole life and never noticed this. I do remember when the ground floor store of that building was a Nedick’s and explaining to my California cousin why he had to wear shoes walking around New York, while we ate hot dogs and has orange drinks there. Thanks for the story. I have many memories of Macy’s, going back to childhood. Your “70s” photo of Macy’s is actually earlier than the 1970’s. There are “non-yellow” medallion cabs at the corner by the holdout building. According to “Taxicabs of NYC” in Wikipedia, all NYC medallion cabs had to be all yellow as of 1967. Non-yellow cabs are also a childhood memory, that’s what clued me. Good eye Force Tube, thanks. I’ll fix it in the copy. Very cool. I wonder if it has a separate interior as well and what it’s used for – it looks like the ads cover all but one floor of windows. I think there’s a Sunglasses Hut on the first floor. And as Alex mentioned above, it used to house a Nedick’s. This Alex remembers the Nedick’s store as well. There were only stand-up counters for customers to eat and drink, but it did a lot of business. Fascinating. 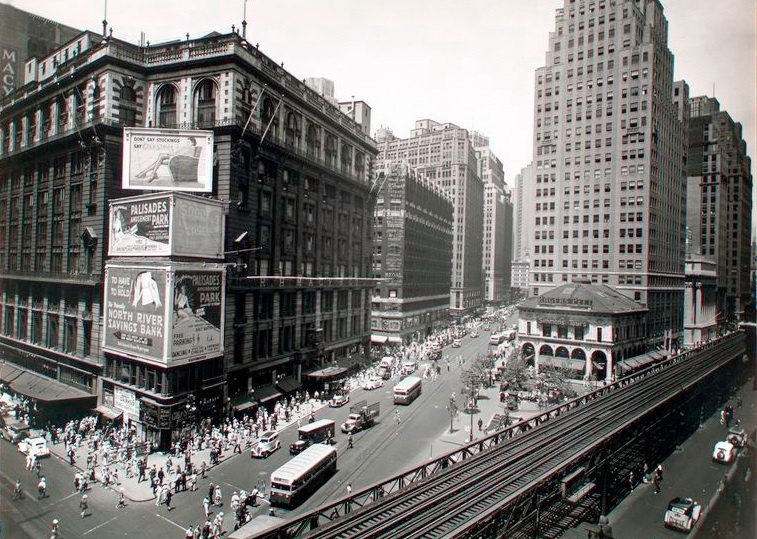 But the question remains: How is it that Macy’s, then and now, has the right to put up the billboards and banners that pretty much obscure the building? They must have some control over it, no? Reportedly they rent the space for signage. Boy does that bring back memories, I thank the one writer who remembered the Old Nedicks, wow, were does the time go. Remember being a kid and walking through the Macy’s store, wow for got all about it. Over the years it’s housed different stores, but only on the first floor. I don’t know who owns it. Macy’s I’m sure could buy it if they want, but I guess on principle they won’t. Is there anything in it now? I would imagine that as much money as Siegel-Cooper makes from Macy’s, they would make even more leasing out the interior. I moved out of NY a while ago, but I used to walk past that corner a lot when I took the LIRR at Penn Station nearby. Do I remember correctly – is there a plaque or some other sort of marker on the corner building, saying that that piece of property is indeed not part of Macy’s? I’m not sure, but I’ll try to walk by this weekend and look for one. Seymour Durst published a book in ’84 called “Holdouts!”, chronicling this phenomena. Unfortunately now out of print, so a used copy will cost ya. We had something like that in Spokane, though granted it wasn’t as iconic as the corner of New York’s Macey’s. Our biggest hospital stands on the South Hill– Grand Street has to go around it, it’s so big. Yet if you look between two of the huge buildings in the complex, you’ll see an old-fashioned white house smack between them– fairly large, quite pretty. The locals call it “Mary’s House”. Part of my families’ lore is that Great-Grandma and Great-Grandpa owned either a dry goods store or hat store and sold the land to Macy’s and lived comfortably ever after. Is there a way to find out what stores were there before Macy’s and who owned them??? Does anyone know when the two balconies were removed? I noticed in the 1936 picture they are there, but not in the shot from the 1960s. Along with the balconies, other changes that were made including the rooftop lighting, the double-flag poles that adorned each corner of the building and the rooftop railing. I was just curious if some (or all) of these elements were removed due to safety concerns or something else. We’re right across Herald Square from Macy’s and have always wondered the background behind that building. Great photos! If Macy’s doesn’t own it, how are they able to cover it up? Macy’s leases ad space from the building, so they can do what they want with it–which is to cover it up. I have lived in New York City all my life and I, too, remember the Nedick’s there with the counters and standing up to have a drink there. I never realized, though, I should have, I think, that this was not part of Macy’s. Thanks for this great story and for all the other stories about these little buildings. Before I read the story about the building that’s covered up by Macy’s on 34fh St., I thought you were talking about the round Macy’s in Elmhurst, Queens. There was a tiny, holdout building there, too. Macy’s had to build around that one, too. Thanks so much! I’ll have to check out the Elmhurst Macy’s. I have a feeling the little building at the Elmhurst Macy’s is no longer there. I think I remember that it had been sold and something was there in it’s place. Here is a link to the full story on the Elmhurst Macy’s “holdout”. Fascinating, thanks Force Tube. What a terrific story…and a horribly ugly Macy’s, but oh well. I can’t fault you for thinking the Queens Boulevard Macy’s “ugly”; it’s in that unfortunate period between “new” and “classic”. It’s just dated. But when it went up, I remember being taken with its design that was then thought modern and dramatic. I think our perceptions of buildings change over time. To cite an example, who thought anyone would want to protect Manhattan’s white brick apartment buildings? Well, they do now. Point well taken, especially about the white brick buildings. I do think the Macy’s looks like a giant-size dial from an old appliance though…. About 100 years ago I worked at the corporate offices for Macy’s New York (alrite more like 25 years ago) and I had to help research, write & make a slide show for a presentation then MNY Present, Mr. Yalof was making to some visiting British retailers. I learned all this history at that time (thank you for the refresher!) because Macy’s had a wonderful historical archive I could use (pre-Internet, you know). 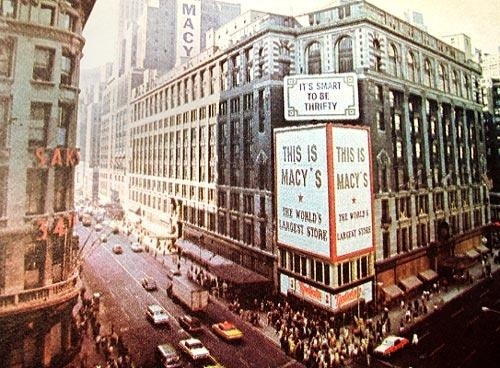 Did you also know that the Macy’s building was put up in two stages and the original building went from 34th-35th on Broadway but only went about half-way down 34th? The Stearns then built the 2nd half later (I can’t remember exactly how much later) and there was ANOTHER holdout building on the corner of 35th & 7th. I believe it was a flower shop or something when I worked there. I haven’t been to the Herald Square store in years, but you could always tell where the buildings were joined because the floors don’t match up exactly, hence the 2 or 3 steps in the middle of the 1st floor and (when I worked there) the strange slope in the middle of the 7th floor. I am the contractor that built the Sun Glass Hut world headquarters there. I believe I did it in 1997 ish. It was a Needicks hot dog store that had been closed for years when I started the renovation. I remember the Nedick/’s that was there. I wonder how many people rememer Nedick’s. They were known for an orange drink. Thalso sold franks. Caro says provides the most accurate additional information regarding this post. The original Cooper-Siegel site had a three story structure, which I’d be happy to send an image of from 1903 if asked. 168 W. 35th St. was the other hold out site. When Caro worked there it may have been a flower shop. It is currently a Dali Market catering to the lunch crowd. did u know the mercer family went to court in the 30’s and 40’s because of a 99 year lease was up and Macy’ s refused to renew or pay rent for the property that Macy sits on.